KQED's Jon Brooks posted a full transcript, audio and some commentary (always fun) about Scott Shafer's interview with Nancy Pelosi. It's a great overview of the drama surrounding the Act over the years. The LA Times is reporting that "California stands to receive as much as $15 billion a year to extend coverage to millions of the poor and uninsured starting in 2014." Welcome news after last night which saw Governor Jerry Brown whittling almost $200 million more from the budget before finally approving it. KQED's News Fix blog has a great post up about all the tweets flying around after the decision. Some ill advised ones from public officials. And a slew from disgruntled Americans who don't like the health care plan announcing they're "moving to Canada." Hmmmm. Update 11:43 AM "The Horse Is Out Of the Barn"
The head of California's Health Benefit Exchange, Peter Lee, just spoke. He's been leading California's efforts to create an online market for health insurance. He long contended it would move ahead regardless, but the mandate for all to have insurance definitely ups its relevance. Lee said his goal was to make an online system that would make buying health insurance as simple as buying a book from Amazon (or almost as simple). He also detailed what this decision means for Californians pocketbooks (or purses as we say in California). Lee also said "the horse is out of the barn," and unlike what some commentators are saying he believes the Affordable Care Act is here to stay. The President spoke to some of the benefits of the law. And referring to the contentious debate Obama said it should be clear by now I didn't do this because of political reasons. Stay tuned for more reactions to the decision from within California. The decision holds some good news for the state, although there are those that say - especially in the immediate wake of another painful budget process - it's going to mean too much spending, with not enough gained. California Healthline lays out the nitty gritty in this article. But here's a quick overview from the piece. On the positive side, some predict it would create 100,000 jobs in the Golden State and others point out that California has long been in the lead in enacting many of the reforms, so we're already well on our way. The article says Peter Long from the Blue Shield of California Foundation and MIT economist Jonathan Gruber last year modeled the ACA's impact on the Golden State. Add about $280 in average economic benefits to each household. Sounds good. But critics say that the additional costs could actually lead to job losses. Voices of concern come from the left and the right. Former US Labor Secretary Robert Reich, an icon of the left, felt the best chance the country had for real health reform was if the law got struck down. Meanwhile some on the right fear it will lead to too much hiring in state and county government. The article goes out on this cheery, are we all just spinning our wheels question: would the ACA just get overturned by a Republican president anyway? The decision is posted here. All 193 pages. A big one. Justices clearly had a lot to say. Here's an article from the Los Angeles Times explaining the intricacies of the tax argument. Now from scotusblog.com: Kennedy is reading a dissent saying the whole thing should be invalid. Meanwhile Ginsberg writes it should be entirely valid. 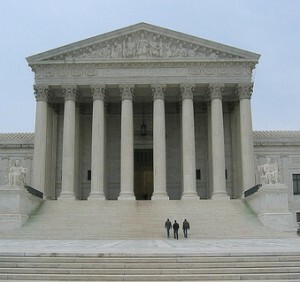 "Justice Ginsburg makes clear that the vote is 5-4 on sustaining the mandate as a form of tax. Her opinion, for herself and Sotomayor, Breyer and Kagan, joins the key section of Roberts opinion on that point. She would go further and uphold the mandate under the Commerce Clause, which Roberts wouldn't. Her opinion on Commerce does not control." (AP) WASHINGTON (AP) - The Supreme Court on Thursday upheld the individual insurance requirement at the heart of President Barack Obama's health care overhaul. The decision handed Obama a campaign-season victory in rejecting arguments that Congress went too far in requiring most Americans to have health insurance or pay a penalty. Chief Justice John Roberts announced the court's judgment that allows the law to go forward with its aim of covering more than 30 million uninsured Americans. Update, 7:12 AM: Scotusblog reports: So the mandate is constitutional. Chief Justice Roberts joins the left of the Court. The Medicaid provision is limited but not invalidated. Scotusblog reports: The individual mandate survives as a tax.